He wheeled it over on the dolly and I made room for it in the garage. It has served a great purpose as a second refrigerator, mainly for storing beer, but having the extra room to put stuff when we have no room in our main fridge was just an added treat. I have wanted, for quite a while, to move away from bottling and into kegging in my homebrew operation. My wife and I have been looking at buying a new house for a little while now, but in order to prepare our current house for sale I needed to do something with all of the bottles I’ve collected over the years used to bottle my beers. I saw this as an opportunity and jumped on it! I told her that if I got the equipment to go down the road to keg, then I could get rid of all of my bottles. She took the bait, and I reeled her in. 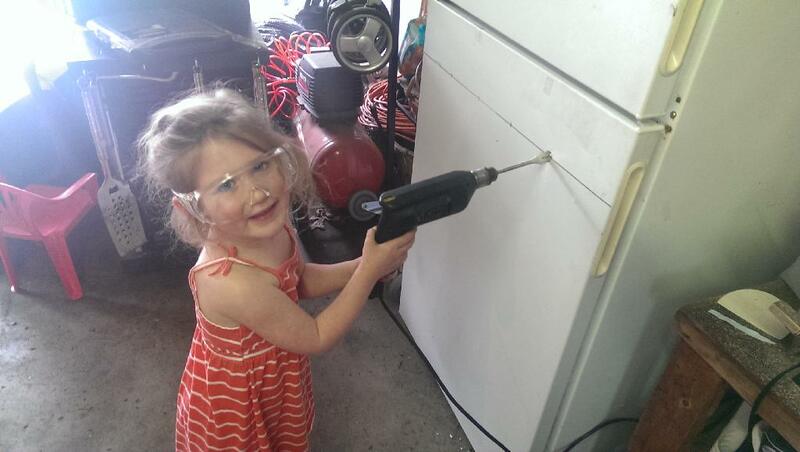 So here we are 2 year later, and I now have my 4 year old daughter drilling holes in the front of what is to be deemed project “4 taps, 3 testicles, 2 dudes, 1 goal” (at least for me. JJ’s on his own for a creative project name.). So I am going to go ahead and call out the joke that many others are thinking while reading this: “3 testicles, 2 dudes and 1 goal? What sort of operation are you running over there?” Now you can’t call it out, or else you’ll just humiliate yourself. Saw – Table saw would work best, unless it’s buried in the corner of your garage. Then just grab whatever saw you can get your hands on. In my case, it was a jigsaw. Start off by determining where you want to place your taps. I did 4 taps and put the centers 5″ apart from each other. Draw a line across the door, mark your centers, and drill a pilot hole with the small drill bit. Once you’ve got the pilot hole drilled, drill out the tap holes with the step bit all the way to 7/8″. Originally I used a 3/4″ spade bit to drill the tap holes, but then had to go back and finish it with the 7/8″ step.